I'll never forget the first trade I made in my personal brokerage account. I was sitting in my apartment in Los Angeles, California, at 6:30am when the opening bell rang in New York City. I had a plan in place and my order queued up ready to go. About 5 minutes later, I hit the green button on my trading platform to purchase my shares of stock. Then the whirlwind of emotions struck. Two minutes later I had lost $100. Four minutes later I had lost $175. Then thirty minutes later I was up $4. I hit the sell button and sold my shares for the smallest gain. After taxes I would have made enough to buy a can of soda, if I hadn't been living in a city as expensive as Los Angeles. My plan going in was to buy these shares of stock as an investment, not to day trade. However, in the process of experiencing everything from excitement to fear, I folded and didn't stick to my plan because my emotions got the better of me. From that day on I implemented a strict routine of planning, following that plan and keeping my emotions in check. We were struck with waves of volatility in 2018, so it's only natural for investors to be on edge and looking for answers as to what will transpire in 2019. The honest answer is: I don't know. And neither does anybody else. Unfortunately, no one can control what direction the stock market will go, but we can control our investment plan and stick to those predetermined rules. Making investment decisions based on emotions is not ideal. Everyone should stick to a strategy that suits their timeframe and goals, determine what is noise and decide what should be acted upon. As hedge-fund manager John Paulson once said, the stock market "goes up or down and you can’t adjust your portfolio based on the whims of the market, so you have to have a strategy in a position and stay true to that strategy and not pay attention to noise that could surround any particular investment." The behavior of investors and traders fascinates me. One of my favorite things to track is market sentiment. Anyone with an investment account knows that fluctuations in their balances can affect their emotions. It's beneficial to keep emotions under control to be successful in the long term. If we buy every time the market looks amazing and sell on every correction, we're doing more harm than good and enter a never-ending cycle between euphoria and despair. To try to avoid getting trapped in this cycle, I find it imperative to follow the data and remain unemotional. Tracking market sentiment shows that many times when people are overly optimistic, the market may be ready to cool off and pause for a while. Likewise, when everyone is extremely pessimistic, we may be on the verge of a rally. Nothing is perfect, but when combined with other indicators, I find sentiment to be a helpful tool in determining whether a given rise or fall in the stock market is meaningful or simply short-term noise. One gauge of sentiment - which you may have heard mentioned on television - is the CNN Fear & Greed Index. Based on a calculation of multiple inputs, the index generates a score that shows whether fear or greed is predominant in the market at any given time. 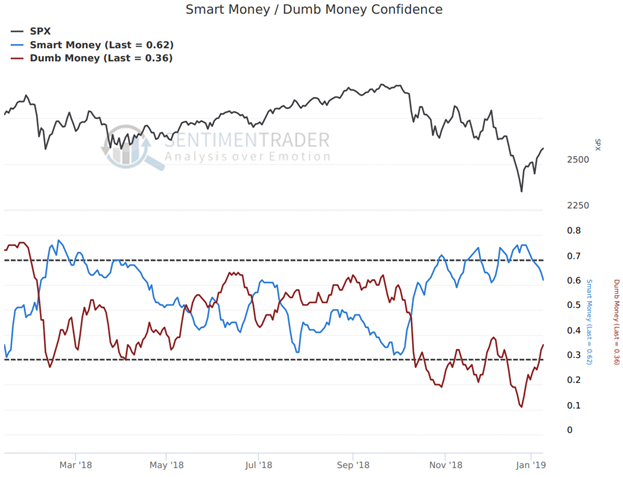 There are also research companies that focus exclusively on compiling this type of data, such as Sentimentrader, that have built a model by which they track the so-called "smart money" and "dumb money." The labels sound harsh, but the point they are trying to get across is that there are investors who don't let emotions cloud their decisions, and investors who emotionally react to changes in price. In the image below, the blue line represents the smart money and tends to move inversely to that of the S&P 500, which is represented by the black line in the top portion of the image. Conversely, if we look at the dumb money, which is the red/brown line in the bottom half, we can see that the movements tend to mimic those of the S&P 500. When price rises, the investors' confidence tends to rise, and when price falls, their confidence tends to fall. 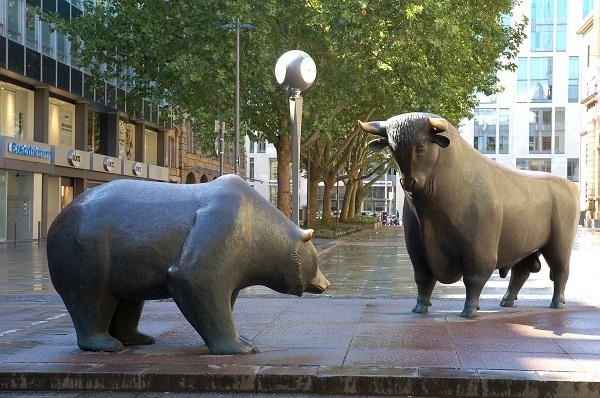 However, since the October 2018 sell-off began, the dumb money may have gotten it right. Or have they? Time will tell. My biggest take away from these indicators is that they show that the crowd is rarely right. Selling every time the market looked like it was starting a new downward trend would hurt more than it would help. In general, sentiment tools - such as these and many more like them - can be one extra set of tools to help visualize the collective emotions of stock market participants. As with any indicator, there will be times they are right and many times they are wrong. Remember that no strategy is perfect, just like no human is without some degree of emotion. If you would like to find out more, click here.